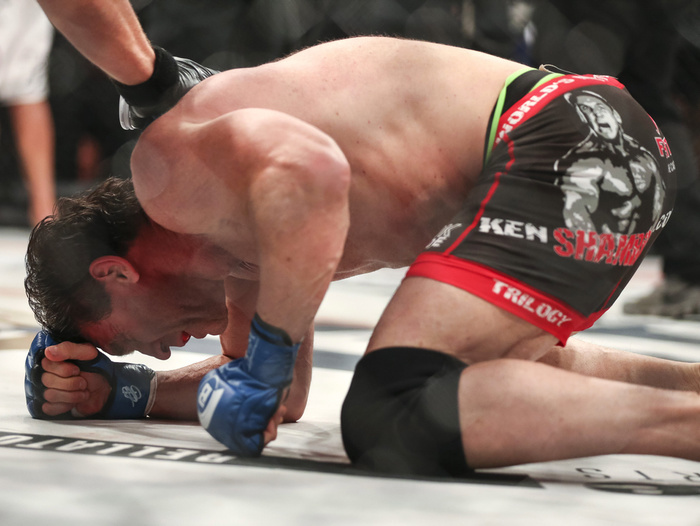 In case you don’t remember the bizarre third match between two UFC hall-of-famers at Bellator 149, it ended shortly after the first round started when Royce Gracie threw a knee that struck Ken Shamrock in the abdomen (or groin, depending on who you ask), followed by a knee to the head, a takedown, and TKO via hammerfists. It was peculiar that Ken didn’t seem to react to the first knee, but the referee didn’t intervene and call the foul… so Royce fought on. Immediately after fight was called, Ken started shouting—claiming that he had indeed been hit below the belt, and that Royce, “did it on purpose!” He later apologized for his anger, saying it was not Royce’s fault for continuing, but the fault of the ref for failing to identify the foul. In an impromptu “Gracie Breakdown,” Royce’s nephew Rener and Lyoto Machida acknowledged the groin strike, but blamed the controversial ending on Ken’s late reaction. A couple days later, Rener, this time with his brother-in-online-belt-promotions, Ryron, published another Gracie Breakdown—this time taking the stand that the knee did not strike the groin at all, and that the fight was just another classic case of Helio Gracie’s perfect self-defense system. After watching the fight over and over again, we are still uncertain who to believe. In any case, it wasn’t Royce’s job to stop fighting unless the sole arbiter of the bout, the referee, told him to. We saw a similar situation occur last weekend when Michael Bisping started to argue with the ref about replacing his mouthpiece, and got kneed in the face by Anderson Silva.